St. Philip Neri Church, located on the west coast of Sri Lanka, about 37 km north of Colombo. There are many famous Roman Catholic churches in Negombo, most of them were built by Portuguese. Due to higher number of churches, Negombo city is called little Rome! St. Philip Neri Kirche, an der Westküste von Sri Lanka gelegen, ca. 37 km nördlich von Colombo. Es gibt viele berühmte römisch-katholischen Kirchen in Negombo, die meisten von ihnen wurden von Portugiesen erbaut. Aufgrund der höheren Anzahl von Kirchen, ist Negombo Stadt namens Rom wenig. St. Philip Neri Church, située sur la côte ouest du Sri Lanka, à environ 37 km au nord de Colombo. Il ya beaucoup de célèbres églises catholiques romaines de Negombo, pour la plupart d’entre eux ont été construits par le portugais. Grâce à un plus grand nombre d’églises, ville Negombo est appelée petite Rome. My parents Shirley Meynert and Marguerite D’Olivera were married at St. Philip Neri Church on the 13th October 1945. I visited this church with my husband in 2013 for the first time since our family left Sri Lanka in 1972. Being there was awesome and we were so very pleased it has been well maintained and cared for with much love. Thank you. 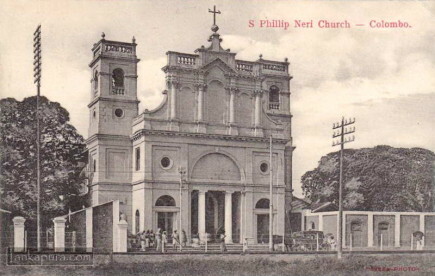 This is an old photograph of the St.Philip Neri’s Church and it is located in Pettah, Colombo, not in Negombo.